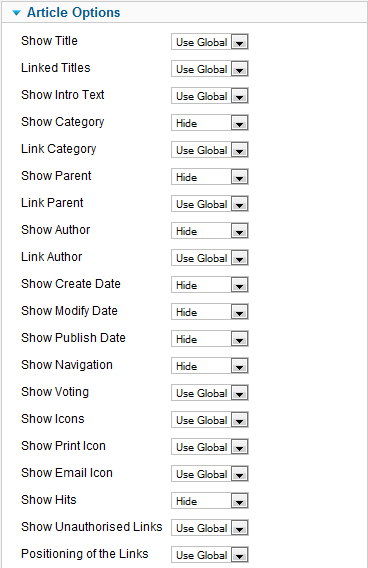 Click the Menu Item Type Select button and then click the Single Article link under Articles. 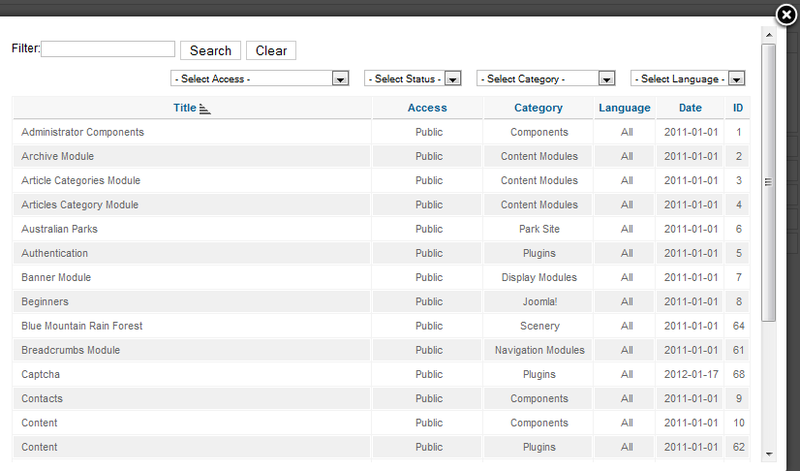 To edit an existing Single Article Menu Item, click its Title in Menu Manager: Menu Items. Used to show one article in the front end of the site. Select Article. This field holds the article to be shown in this layout. Press the Select/Change button to open the article selection modal window, as shown below. This screen is similar to the Article Manager. You can use the Filter fields to find the desired article and then click on the article's Title to select it. At that point, the modal window will close and the title will show in the Select Article field. The Single Article Layout has the following Article Options, as shown below. These options determine how the article will show in the layout. Positioning of the Links. (Use Global/Above/Below). If Above, links are shown above the content. Otherwise they are shown below the content. If you have a Single Article Layout defined for an article, that layout will show any time a user drills down to that article. For example, if an article is shown on another menu item type (for example, in a Category Blog or List Layout or a Featured Articles Layout), the user will be taken to the Single Article Layout for that article (if defined). Archived articles are no longer published but are still stored on the site. Articles are Archived using the Article Manager screen. Note that Articles assigned to the "Uncategorized" Section will not show on the Archived Article List layout. 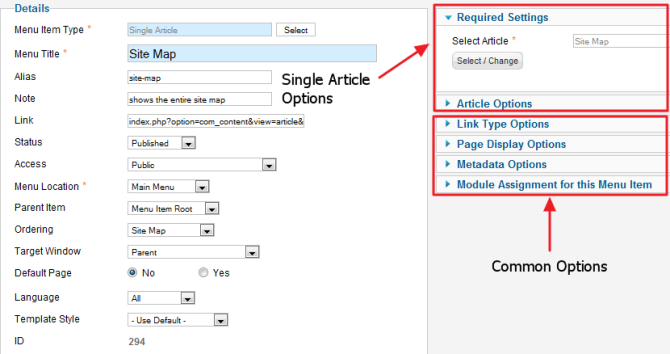 Articles are created using Article Manager: Add or Edit. This page was last modified on 9 February 2013, at 10:40.